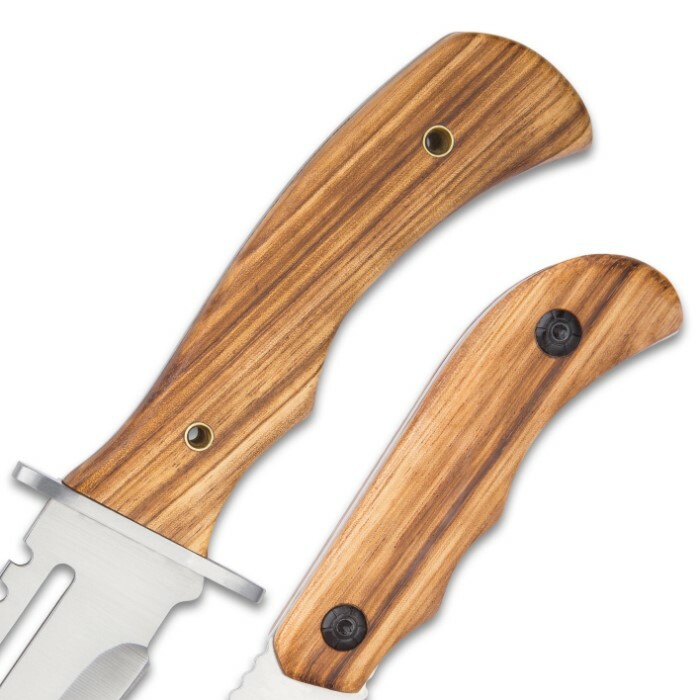 Timber Wolf Wildstreak 2-Piece Zebrawood Fixed Blade Knife Set - 8 1/2" Gut Hook and 15 3/4" Bowie - 420 Stainless Steel - Genuine Zebrawood - Nylon Belt Sheath - Outdoors, Survival, Collecting & More | BUDK.com - Knives & Swords At The Lowest Prices! 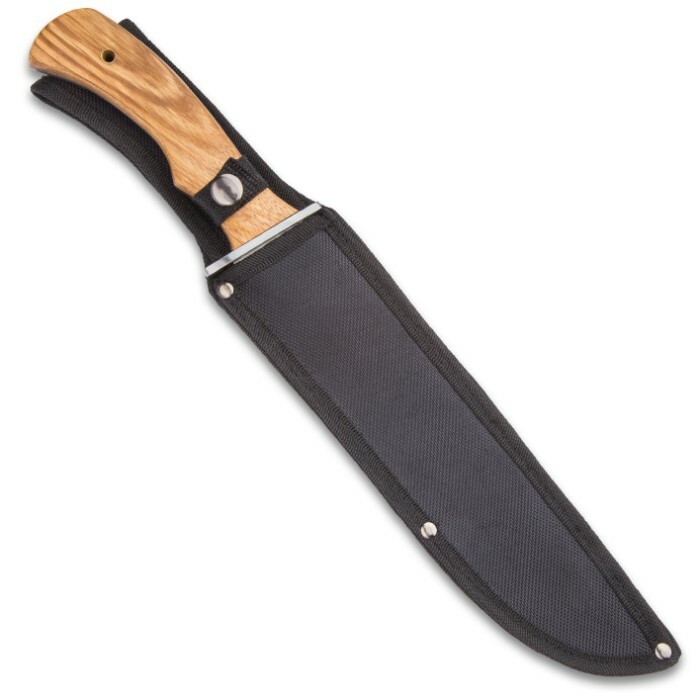 Bowie: 10 1/4" clip point blade with angle spine cutouts; 15 3/4"
Have a bit of a "wild streak?" 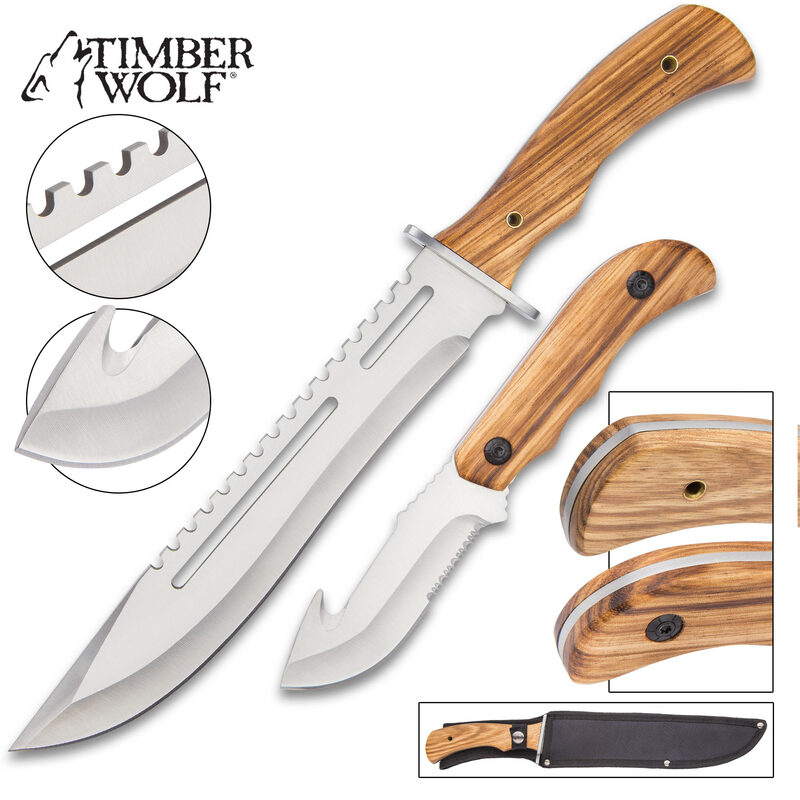 Go wilder with Timber Wolf's "Wildstreak" 2-Piece Knife Set. 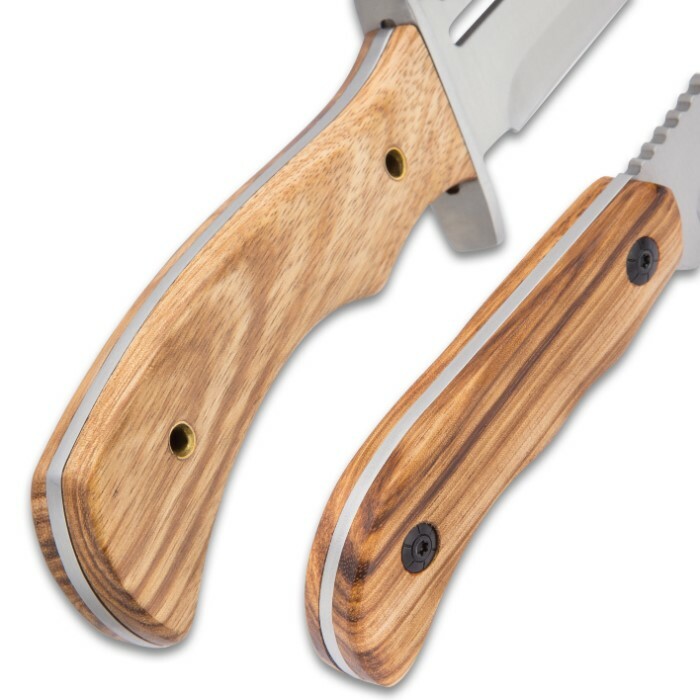 This savage zebrawood duo is an outdoorsman's dream, with two distinct, yet equally capable knives tailor made for hunting, camping, fishing, survival and more - a handy 8 1/2" gut hook fixed blade and a hulking 15 3/4" bowie. Both knives are housed in a single heavy duty nylon belt sheath, so they're easy to transport and keep together at all times. The Wildstreak set offers versatility and range that simply can't be matched by any single knife. Each knife brings its own unique capabilities and strengths to the field, allowing for fine, precision cutting, rigorous hacking and chopping, and everything in between. Both feature resilient, razor sharp 420 stainless steel blades, full tang construction and gorgeously striped zebrawood handles. The gut hook is great for more than just field dressing game, cleaning fish and the like. It's an excellent all-arounder - easy to manipulate yet amply sized to tackle day-to-day chores and then some. 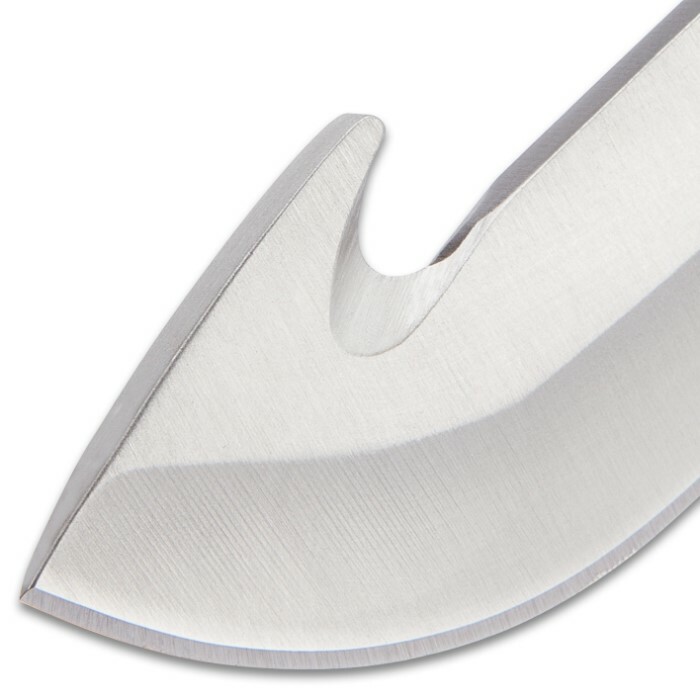 A craggy serrated edge affords even more versatility.The bowie is big. Really big. And rest assured, it's all muscle. 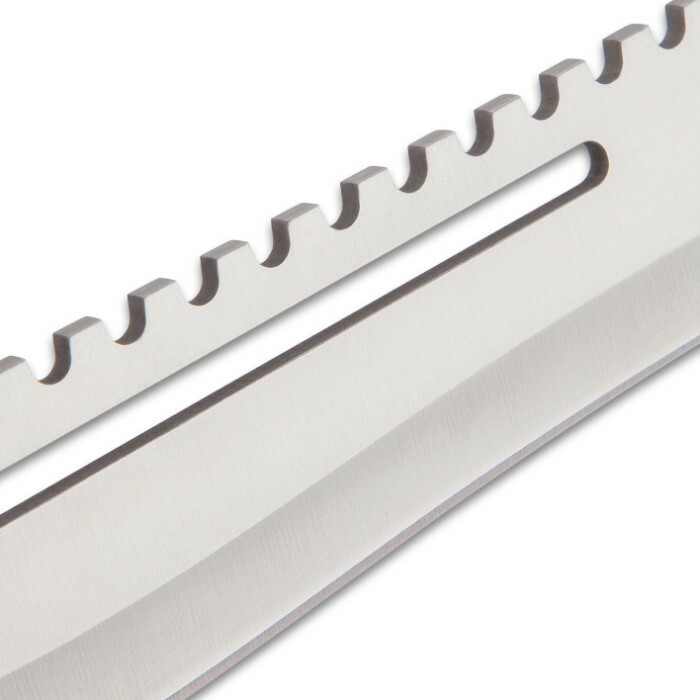 Its mammoth clip point blade makes quick work challenging jobs, staying razor sharp through it all. Back-angled cutouts along the spine impart a sleek, menacing look. The zebrawood handles on both knives are not only eye-catching and beautiful, they offer a "beautiful" grip and hand-feel, as well! Tough as nails and loaded with complementary features, the Timber Wolf Wildstreak Set is a prime example of fusing beauty and brawn. Whether displayed in a collection or tested in the field, the Wildstreak knives always perform at the top of their game. This is a good looking two knife set that is a value buy. Sharp,good looking,and priced right. What else do you want?